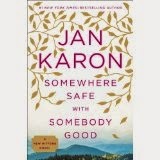 Jan Karon's newest book in the Mitford series, Someplace Safe With Somebody Good, was a choice for reading in our church book club. Unfortunately there were several who had never read any of the others in the series and almost gave up on the book before they got a third of the way through. Karon begins by trying to catch the reader up on a lot of the characters that have appeared in Mitford's history. Even if you have read the whole series as I have, it is slow going in the start. That said, stick with it because if you love a good story, sweet humor (often tongue-in-cheek), and characters that are lovable, this is a great read. Here's the back copy blurb: After five hectic years of retirement from Lord’s Chapel, Father Tim Kavanagh returns with his wife, Cynthia, from a so-called pleasure trip to the land of his Irish ancestors.While glad to be at home in Mitford, something is definitely missing: a pulpit. But when he’s offered one, he decides he doesn’t want it. Maybe he’s lost his passion. His adopted son, Dooley, wrestles with his own passion—for the beautiful and gifted Lace Turner, and his vision to become a successful country vet. Dooley’s brother, Sammy, still enraged by his mother’s abandonment, destroys one of Father Tim’s prized possessions. And Hope Murphy, owner of Happy Endings bookstore, struggles with the potential loss of her unborn child and her hard-won business. All this as Wanda’s Feel Good Café opens, a romance catches fire through an Internet word game, their former mayor hatches a reelection campaign to throw the bums out, and the weekly Muse poses a probing inquiry: Does Mitford still take care of its own? As you can see, there are a lot of character's and subplots or stories but Karon eventually sorts them all out for you and makes it a delightful trip to this little town of Mitford. A nice book for the road.